This is one of the darker issues of The Future Fire that we’ve seen in a while. It’s not full of horror stories, but rather of tales of gritty determination, of dystopian resilience, of unfulfilled (but never hopeless) longing. We don’t bring you happy endings—too few of those around these days—but we bring you noir heroes who survive, desperate rebels who haven’t lost everything yet, and aliens who still have a head or two to regrow. Stories (or poems) with genderqueer, retro-cyberpunk social justice warriors; brightly lit skies that ask us what is the cost of the future; trippy twists on the memory loss narrative motif; postmodern, polyglot, alien futures; and brutal, classic, low-fantasy fairy tales. In a similar vein, next month sees the release of Fae Visions of the Mediterranean: An anthology of horrors and wonders of the sea (e-book available for pre-order), co-edited by Valeria Vitale. This volume, whose title is in part a reference to the Fatamorgana, a mysterious and magical mirage (itself named for Morgana Le Fay) well-known to seafarers and coastal residents alike, highlights through folklore, ghosts and sea monsters the fact that the Mediterranean is a world of its own. Since ancient times, and no less today, this sea has been a road for merchants, pirates, invaders, exiles, adventurers and storytellers; the peoples on the shores of this sea—artificially divided in modern thought between Southern Europe, North Africa and Near East—often have more in common with each other than they do with their hinterland neighbours. The stories capture the wonder of the Mediterranean and the many mythologies and beliefs that have sprung up around it, gods who live in it, and tales that couldn’t take place anywhere else. They also respond to tragedy: a million ships have sunk since humans first launched boats into the blue. It feels like half of them were in the last twelve months. It’s been an amazing anthology to work on: some of the hardest and most thrilling content to read through, but also the easiest to buy for—we totally fell in love with every story and poem we included in the volume, thanks to all the wonderful authors and translators. Look out for more from them in the near future! 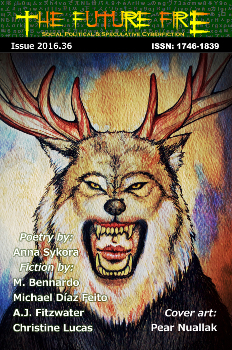 In the meantime, enjoy the weird and wonderful writing of A.J., Anna, M., Michael and Christine, and the beautiful artwork by Miranda, Carmen, Christina, Cécile and Pear, in the current issue. Tune back in June and July for the next installment. We’re looking forward to it at least as much as you are!